We invite you to envision and build with us a magic place where the Burning Man principles have been constitutional principles for the past 20 years… visit the 20th Anniversary Celebrations of The Burning Republic in the year 2039! The Vienna Burning Ball is a participative event organised by the Austrian Burners community according to the 10 Burning Man principles. This year, our theme is “A brave new world”. Please, be aware: You do not attend a party! You are invited to join the celebration of 20 years of The Burning Republic and may even apply for citizenship. The utopian experience might be marvellous, incredible, thunderous and slightly uncomfortable. However… the truth behind happiness is not always what you expect. You can be part of the experience as a full participant (“working class” ticket, i.e. a citizen passport), a tourist (“visitor ticket” i.e. a tourist visa) or an art sponsor (“oligarch ticket” i.e. an oligarch visa). Working class ticket: As a citizen of the Burning Republic, you get the full participative experience – that means, you co-create the event. Please get in touch after buying your ticket via the form provided by the Burning Republic Embassy to get your citizenship credentials. indicate whether you would like to pick a work shift (e.g. gate, greeters, build, players, deco, art, performers, and so many more…). Or tell us in what personal and special way you wish to contribute to the well-being of our beloved country. Visitor ticket: You have never heard of the Burning Republic, but you are curious to visit this happy place? Then apply for a visa! Come learn the formula and uncover our secrets. Our citizens will welcome you and help you to get acquainted with our special way of life. Oligarch ticket: You love the Burning Republic and you would like to contribute by paying a little more, sponsoring our 20th anniversary art exhibition? Become an art sponsor and get this ticket/visa category. Your experience will be fuller and the event more colorful, exciting and memorable if you join the participative effort and co-create, communally or in your individual way, in advance or spontaneously at the event. If you hesitate for whatever reason and choose the visitors or oligarch ticket (e.g. because you don’t know what to expect or how to contribute), but feel inspired later on, do get in touch and become a citizen by choosing your way of participation via the form provided by the Embassy. Please be aware that working class might have privileges coming with the luxury of a job well done that might not be available to non citizens. Kindly note that everyone – citizens and non citizens alike, no matter the intensity of participation, need to get their passport or visa (aka ticket) – including artists, performers, DJs, organizers and working class volunteers! Here you can apply for a passport or visa (aka ticket sale). For government aid and possibility of a subsidized residence title please contact the Department of Radical Inclusion which will help you with Immigration Papers by applying for one of the low income tickets below. For questions regarding passport/visa registration (aka ticketing), please contact embassy@burners.at. You can participate and become a citizen of our Burning Republic by signing up here. This is NO normal Party! The Vienna Burning Ball is a dedicated space where each participating personality is not only a guest, but also a participant, bringing a unique potential to create something extraordinary. This means that everything you will see or experience at the ball is created by volunteers. You can participate in the event in many different ways – or take everthing in with a fresh eye on site, and interact with the art, projects or people! If you bring specific talents, you are more than welcome to stage them all (no matter whether music, dance or acrobatics,…. ), to bring and set your (big or small, loud or silent, interactive or stationary) art projects, to hold a workshop before the event, to volunteer for build or strike, decoration, greeters etc. – or to contribute with something completely different! Let us join our creative energies and create something memorable together. If you want to offer and gift your talents, please fill out the form for participation. * Sound, light, performances: Do you have technical talent? Do you want to help taking care of our stage or to create light effects? Or do you want to DJ or do a performance? Please contact performance@burners.at. This regional event of the Burning Man community is a space where Burners from all over the world can meet to get together and celebrate. This event is organised by the Austrian Burners and inspired by the community around the Burning Man festival. 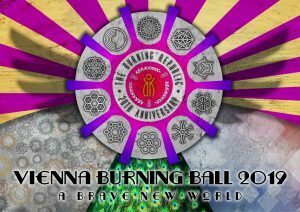 The Vienna Burning Ball exists since 2014 and is a yearly party in the sense of a Burning Man decompression. This means that Burners from near and afar come together to celebrate together and remember past Burning Man events. However, for all those who are intersted, but have never been to a Burning Man event, the Vienna Burning Ball is just the right event to dive into this wonderful world! The Vienna Burning Ball is organized around a theme acting as creative impulse and inspiration for art projects, musical or artistic performancs and the costumes of the participants. The Burning Man community is based on 10 principles, which act as the foundation of the creative and positive environment which we want to create. Each participant of the Vienna Burning Ball should know the principles, so that we can all create the unique and safe space that Burners call their home. We stress the principle of “radical inclusion”, and treat each other respectfully and without prejudgements. Please note that there are several compromises to the realization of the principles, and that drinks can only bought at the bar (please do not bring your own drinks). Here you find further infos for participating. * Time of our meetings: Please ask us about the when & where at info@burners.at or check our Facebook page for details.